Left hand design, lightweight breathable mesh shooting vest with a full-length shooting patch, bellows pockets for shells/gear, and a large back pocket for hulls and other gear. Cover the basics.A shooting vest shouldn't be bulky and impede your movement. It should give you plenty of storage for your shells and safety equipment, a nice recoil pad, and keep you cool when it's hot out. 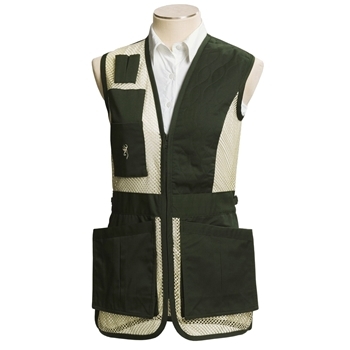 The Trapper Creek mesh shooting vest has you covered on all these points and more.